Hurricane Ike was a huge Category 2 storm when it hit the Texas coastline September 13, 2008. Its tropical storm force wind field exceeded that of Hurricane Katrina. As a result, Ike’s massive size created a storm surge like that of a Category 5 hurricane. Its 15-foot waves pummeled coastlines from Florida to Texas. It was the most intense storm of 2008. Ike was the sixth costliest hurricane to hit the United States. Total property damage to Texas, Louisiana, and Arkansas was $34.8 billion when adjusted for inflation. Additional damage to Cuba, the Bahamas, and other Caribbean islands boosted the losses to $37.6 billion. Ike was directly responsible for 103 deaths. Another 64 people died in Texas due to electrocution, carbon monoxide poisoning, or medical conditions. A month after the storm hit, 157 people were still missing. If Ike had hit Houston, 50 miles down the coast, the damage would have been $100 billion. That's almost as much as the $125 billion in damage done when Hurricane Harvey hit the area in 2017. Ike hit the Inagua National Park in the Bahamas, home to 50,000 flamingoes. Most of them survived the storm by hiding in mangroves or flying to other islands. Ike’s 15 to 20-foot storm surge completely submerged the Bolivar Peninsula in Texas. Ike created 29 tornadoes. Fortunately, none of them were responsible for any deaths. In 2009, a Norwegian oil tanker collided with an oil rig that had been torn from its mooring by Ike. The oil was safely transferred to smaller ships. Hurricane Ike began as a tropical storm on September 1, 2008. On September 3, it was upgraded to a Category 4 hurricane with winds of 145 miles per hour. On September 7, Ike hit the Turks and Caicos Islands in the Bahamas. Later that day it hit Cuba as a Category 3 storm. 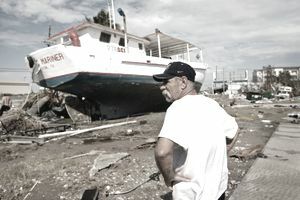 It hit Galveston Island, Texas, on September 13, 2008. The area had just been devastated by Hurricane Gustav. That storm had hit Louisiana just two weeks earlier. Gustav cost $4.6 billion. It had been a Category 4 at its peak but calmed down to a Category 2 by landfall. On September 14, Ike hit St. Louis, Missouri, as a tropical storm. In Ohio, 2.6 million people lost power. It moved into Canada, bringing heavy rains. The humidity shut down part of Montreal’s subway system. More than $1 trillion of insured commercial and residential property lay in Hurricane Ike's path. About $70 billion lay near the shore, with $900 billion further inland. Although hurricanes usually lose power the further inland they go, much of Ike's damage was because it had a very wide path. Cattle ranchers lost 4,000 animals. More than 11,000 workers became unemployed due to loss of businesses. Ike hit Galveston Bay, producer of 15 million pounds of seafood annually. It dumped debris from the floor of the Gulf of Mexico on the shrimp and oyster trawlers that it didn't outright destroy. Those trawlers that could function didn’t find much to harvest. Ike killed any oyster reefs not already destroyed by Hurricane Gustav. The $100 million oyster industry in Louisiana and Texas had produced more than half the oysters in the eastern United States. Louisiana's $2.6 billion seafood industry sustained up to $300 million in losses due to the double-knockout punch of Hurricanes Gustav and Ike. Ike damaged pipelines in the Gulf of Mexico and destroyed 10 Gulf offshore oil rigs. They were shut down as were all 22 Texas-based land-based oil refineries. This part of Texas is home to a quarter of U.S. crude oil and refinery production. Unlike Hurricane Katrina, national gas prices barely budged in response to Hurricane Ike. Oil prices were already in a decline, thanks to expectations of a slower global economy and the end of the U.S. summer driving season. Local gas prices rose to as much as $5 a gallon. Area inventories were low even before the hurricane hit. The Department of Energy delivered 300,000 barrels of oil from the Strategic Petroleum Reserve to the area. How Bad Was Hurricane Sandy? Why Was Hurricane Katrina so Damaging to New Orleans, and the World? What Has Climate Change Cost Us? What's Being Done?